If there is anyone I know that embodies independence, it is Ginger. Through years of travel and experiencing diverse cultures she learned about beauty and the potential for creativity in everyone. 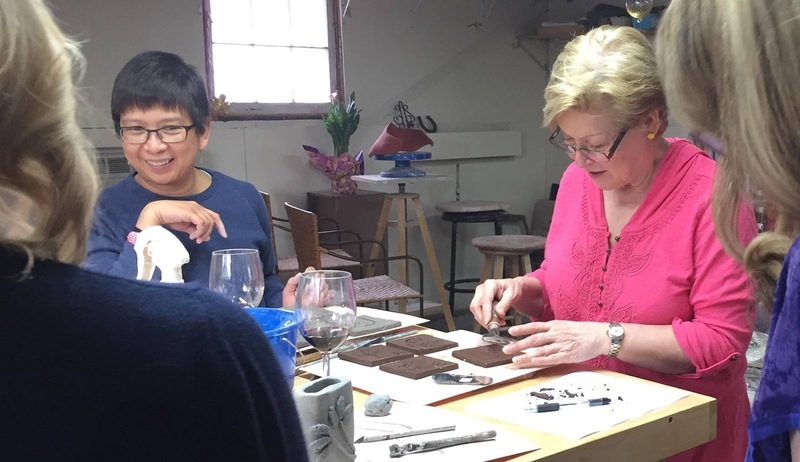 For over twenty years Ginger has been a ceramic sculptor; in addition to being self taught she takes advantage of classes and workshops when available. Her work has been accepted to juried shows and she exhibits regularly in galleries and museums. Ginger gives back to her community by organizing collaborative art shows and serving as a juror for regional high school art competitions. All of this has lead her to want to pass on her knowledge and love for clay to others. She has spent the last year taking college courses and expanding her studio space to accommodate workshops at her studio GO Art Center. Ginger says "In all aspects of my life I've been learning about being independent and how to thrive with what I choose as my artistic passion and how to be thankful for what I have been given." Have you always made art? No, I haven't always made art. I have always appreciated art and noticed beauty. Mostly I've been a daydreamer but when I was young I let everything out in song-I loved to sing. When did you start making art? Why clay? Over twenty years ago. I suddenly "had to buy clay"! I had an overwhelming urge to hold and make things in my hands. It was pretty spontaneous that I stopped at the clay supply store and dove in. I had memories, stories, and thoughts that just appeared when I started sculpting and carving in clay. Much the way someone looks at the clouds and sees images, the images presented themselves as I worked. I found out around the same time that I had the beginnings of macular degeneration and I think the clay was a way for me to prepare myself for feeling my way through life; but I think the clay chose me. My sculptures are hand built with images of human form and nature. As I look back to my first work, I believe I was asking myself questions and finding answers in the clay. What do I love about the ocean? When do the faces in the tree bark speak? How can I express emotions in response to love, joy, fear, or oppression in clay? What are we keeping in that needs to come out and what is on the outside that needs to come in? These were the things and thoughts that are the beginnings of my sculptures. All Aspects of nature and the human condition interests me. I'm an independently spiritual person and find my spiritual energy in life and nature around me; drama found in the details of life. Often there are stories below the surfaces and the clay speaks. I recently returned to Hawaii to join 150 other ceramic artists in a workshop firing raku on the beach. This camaraderie is a very inspirational experience. Tell us about your process. Do you have any favorite tools or equipment? I prefer to work without a predetermined plan or expectation. 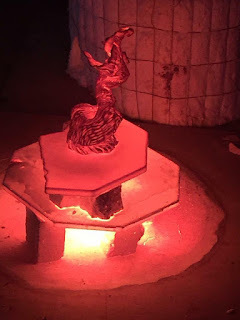 It is important to have technical understanding of how clay works but, thankfully, that part becomes muscle memory and I can create in free flow. This free flow technique allows me to hold a lump of clay and as I roll, squish, and pet the clay I see images that call me to fine tune and embellish them. I especially like to use coil building techniques and I almost always finish a piece with a lot of surface design or textures. I'm not very safe in my approach to building and often times will make things very thin or delicate. My favorite tools are my carving and smoothing tools. Some of them are wooden and others are metal but my favorite is using a smooth stone for burnishing. The best way for me to create in clay isn't a through a tool but the process of firing with alternative methods. So far the ancient Japanese method of raku firing has been my favorite. Raku is very random because you put your work directly into flames. many times the work doesn't make it through the stress of the extreme firing-but when it does, it's worth the risk. Tell us about the classes you are teaching in your studio GO Art Center. Since I started feeling my way through life via clay I discovered the importance of relaxing and working out thoughts while creating. Last year I had the opportunity to expand my personal studio and now that it can accommodate more working space I've invited others to share private time in the studio. 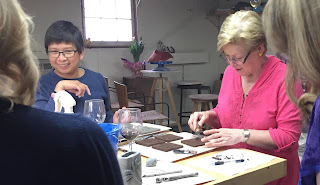 I offer families and friends the chance to spend time together creating in clay. I also have a few people who want to just be alone to independently create clay work in my studio. I help new people learn basic techniques and then allow them to have free flow time creating without pressure. I like sharing the techniques and information I have learned over the years and now that I have room, sharing that information makes me feel like I'm helping others relax and play which is something very important that we often overlook.